Halifax Harbor (according to many (but not all) authorities) is the second largest natural harbor in the world. It is a beautiful place with lots of history and activity. We visited Halifax on the sixth day of our cruise, and Deborah and I had a wonderful time walking along the harbor boardwalk and looking at the boats and at the people. The photograph to the left was taken by my cousin, Randy Rezabek (who along with his wife, Charlene, was also on the cruise). 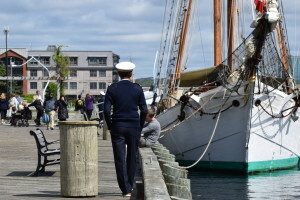 It shows a French Navy training sailing ship that had just been sailed across the Atlantic. We watched the crew go about their morning maintenance work on the ship. Then after a pause for a leisurely, group smoke, they all went for a long run down and around the harbor walkway. Only the French would warm up for a five K run by smoking a couple of cigarettes! There was a nice crowd on the boardwalk and a number of friendly dogs to say hello to and pet. As I mentioned last week, though, there were no seagulls to speak of and the water of the harbor seemed unnaturally still and quiet. I later learned about Nova the hired Harris’s hawk (whom I mentioned last week). Nova served as a local gull assassin and deterrent, but he was not out and about as we walked around the harbor. We did get to see something wonderful, though. Standing out on an extension of the boardwalk next to an art display of “melted” street lamps (you had to be there to appreciate it! 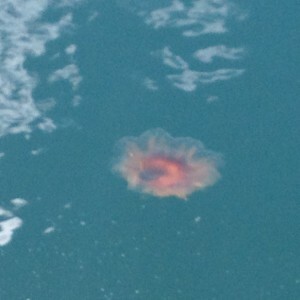 ), we looked down into the water and saw a large, reddish jellyfish (its “bell” was over a foot in diameter) go bobbling by (photo to the left). 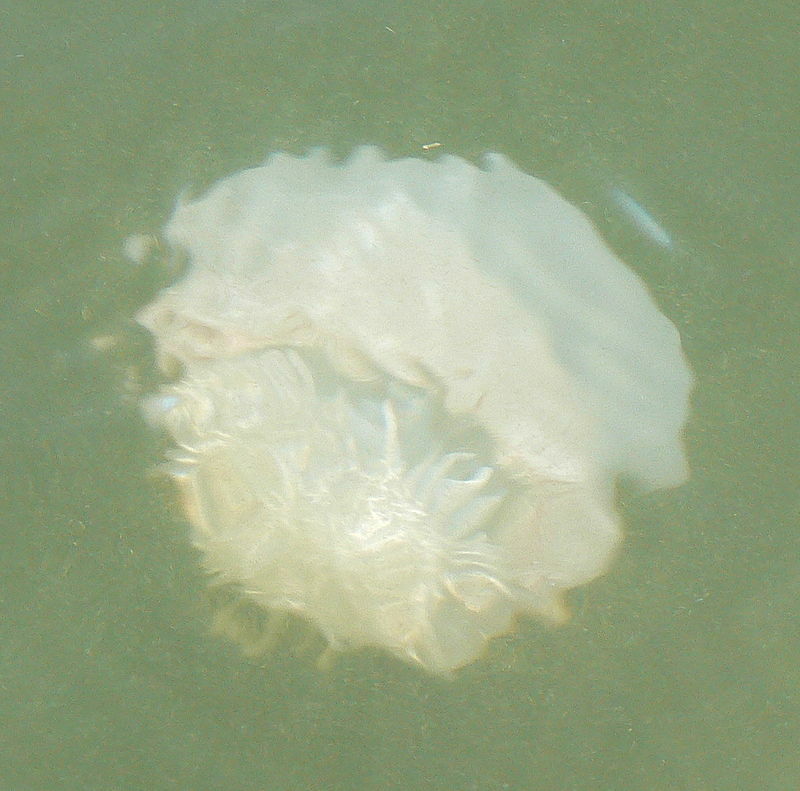 There are four common jellyfish in Nova Scotia: the Arctic red jellyfish, the lion’s mane jellyfish, the constricted jellyfish, and the sea gooseberry. It is likely that the Arctic red and the lion’s mane jellyfish are the same species (the taxonomy of their genus (Cyanea) is very confused). 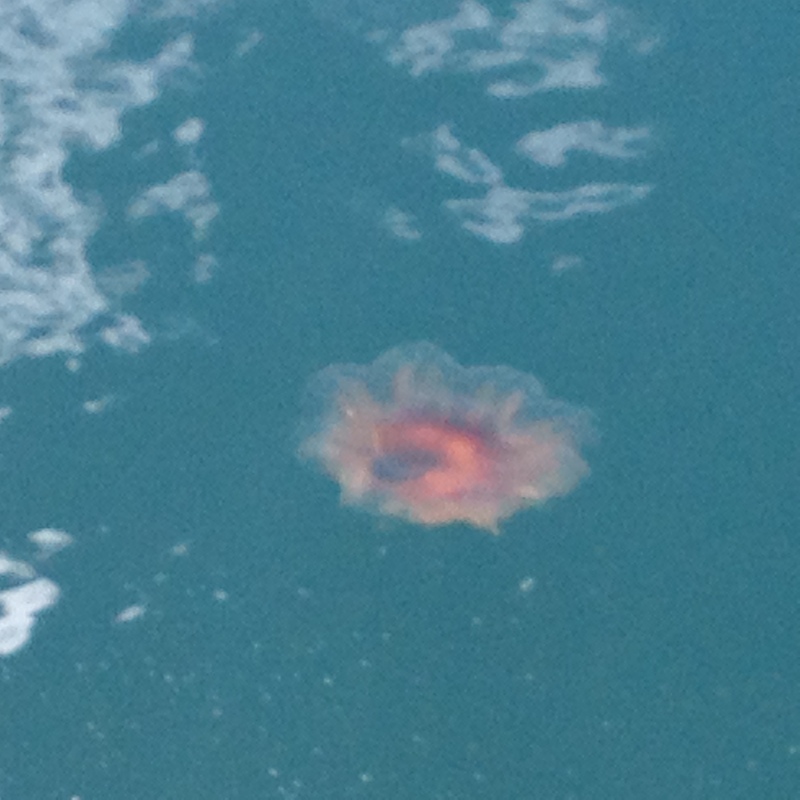 So, seeing the size and the red color of this specimen led me quickly to assume it was a lion’s mane jellyfish (an organism that I have talked about in my introductory biology class for many years (more on that later! ), but one that I had never seen before in the wild!). Deborah and I watched the jellyfish for fifteen or twenty minutes (until it disappeared in the ripples and surface glare of the harbor water). No one else seemed to notice it floating by! Jellyfish anatomy is very simple. They are made up of two layers of single cell thick tissues (one on the outside of the body and one lining the inside). In between these layers (and making up most of their body weight) is a non-cellular mass of gelled water called the “mesoglea.” The two tissue layers have specialized groups of cells that take on sensory functions, nerve-like functions, muscle-like functions, and digestive functions. They also have, especially concentrated on their dangling tentacles, cells called “cnidocytes” that can eject venom-ladened proteins called nematocysts that the jellyfish can use for hunting or for protection. 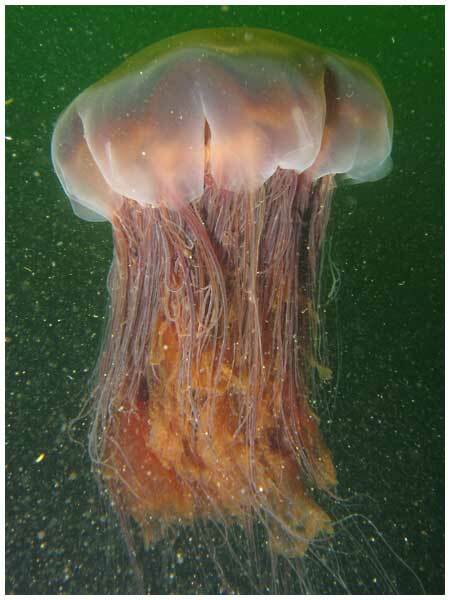 The lion’s mane jellyfish (Cyanea capillata) is especially abundant in the cold waters of the North Atlantic and the North Pacific Oceans. It feeds on zooplankton, small fish, and smaller jellyfish. It in turn is preyed on by sea birds, large fish, and sea turtles (the leatherback sea turtle in eastern Canadian waters avidly feeds on lion’s mane jellyfish!). The lion’s mane jellyfish itself is also a very important hiding place for shrimp and many small species of fish. These vertebrate and invertebrate species live among the tentacles of the jellyfish and gain a significant degree of protection from other potential predators. As I mentioned before, I have talked about Cyanea for many years in my introductory biology course at Penn State. I used it as a vivid example of Class Scyphozoa primarily because of its other common name: the giant jellyfish! In 1870 a specimen of Cynaea washed up on the shore of Massachusetts’s Bay that had a bell that was seven and a half feet in diameter and tentacles that were over one hundred and twenty feet long! “Giant” is a very appropriate adjective for this species, indeed! I don’t know how long it took that specimen to grow to that size, or if there are other Cyanea of equal sizes out in their cold ocean habitats, but the growth potential of the “one footer” we saw in Halifax Harbor could be impressive! There is evidence that jellyfish populations all around the world are increasing. Possibly over fishing has reduced jellyfish predator levels or human generated pollution (especially nutrient runoff into the oceans from agricultural fields) has generated conditions increasingly favorable to jellyfish growth and reproduction. Jellyfish, for example, thrive in nutrient-rich ocean waters that are low in oxygen, conditions that are being observed throughout our human-impacted ocean habitats. 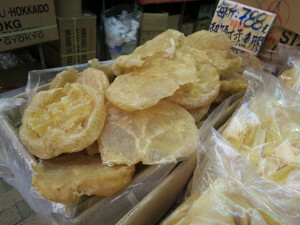 The large “blooms” of jellyfish can have serious economic impacts. Shoreline power plants have had their cooling water intakes clogged by excessively abundant jellyfish. Some plants have even had to shut power production until the jellyfish numbers could be reduced. Amazingly, jellyfish are being actively fished for and processed as human food and are considered to be great delicacies in some Chinese, Japanese, and Korean cuisines! Some shrimp trawlers on the East and Gulf Coasts of North America can actually make more money trawling for jellyfish (especially that “cabbage head” jellyfish (also called the “cannonball jellyfish”) that I mentioned before! I didn’t talk about jellyfish stings or the wild array of “cures” and treatments for the skin lesions caused by the venom in the nematocysts. I’ll save that for another blog! Just watch your step when you walk barefoot on the beach! Sounds like a wonderful trip, Bill and Deborah! Thanks for giving me some appreciation for jellyfish. They are not a favorite site for me when at the ocean. I agree with Paul–ouch! As an ocean-goer since childhood, I’ve seen many species in both the Pacific and Atlantic. My least favorite, as for many people, is the Portuguese Man-of-War. I have watched people along the sand touch them unknowingly and learn a painful lesson. During one of those big “groundings” by wind and current on the Outer Banks, I happened to step on a tentacle detached a couple of feet away from its float and invisible in the sand. Even the detachment still held its poison. Ouch!